Quite often I am asked for my opinion on what device parents should purchase for their school-age children. There are many factors to consider when answering this question and thus, no clear cut answer. However, as soon as I hear that their children's school uses G Suite for Education, it makes sense to suggest an Android device. In this case, I tend to focus on the following factors: functionality, portability, and affordability. 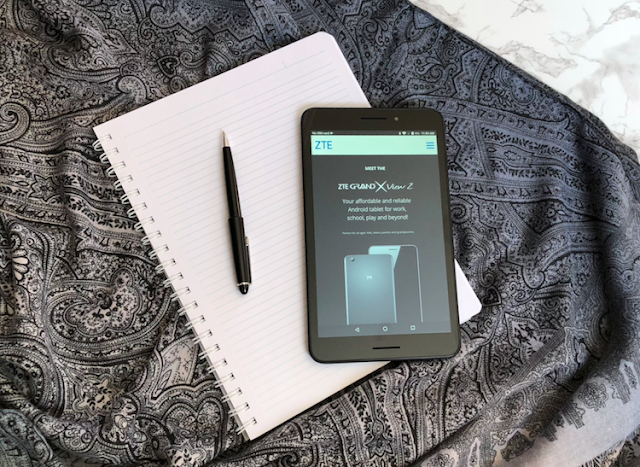 And thanks to ZTE Canada's recent launch, parents can find an affordable and feature-rich solution in the ZTE Grand X View 2 tablet. Today, many classrooms are going paperless and enjoying the added benefits of storing everything in the cloud. Students are turning to portable devices to be able to connect instantly, collaborate in real-time, and maintain their digital portfolio. They can quickly research virtually any topic and prepare multi-modal digital presentations that are engaging and interactive. This is one of the reasons why my son is excited to bring his new Android tablet to school. I have never seen him more enthralled in an assignment, for example, than when we was collaborating with a classmate using Google Slides. Featuring a fast 1.3GHz Qualcomm® Snapdragon™ quad-core processor, the Grand X View 2 tablet will surely be able to keep up with my son. It also boasts 5MP rear and 2MP front cameras which he can use to document his learning, whether it be taking photos while on a field trip or recording video results from a science experiment. Or he could even take advantage of the 8” HD display and explore the local city in street view using Google Maps, which comes pre-installed on the Grand X View 2, or take a virtual tour of a foreign city using Google Earth. 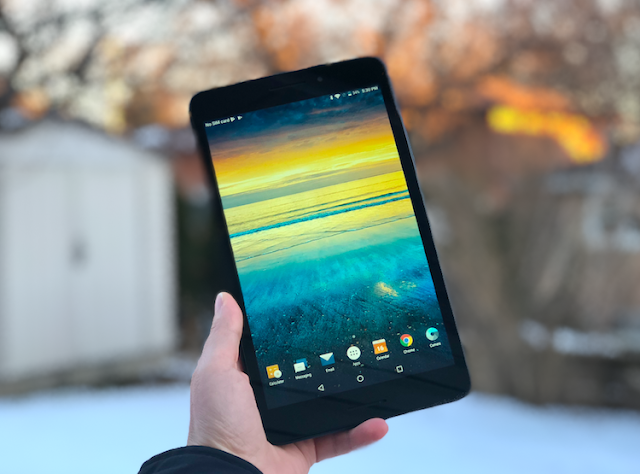 The tablet also includes 8GB of internal storage with expandable memory up to 128GB, but given that my son has unlimited virtual storage as part of his G Suite for Education account, he will likely be reserving storage to download more educational apps and games from the Google Play store. Last year, my son would bring a laptop to school. Despite its size, it was quite heavy but at least he was bused to school. Now that he walks to school, I can't imagine him having to lug it back and forth from school. The Grand X View 2 tablet is an excellent alternative in that it weighs a mere 330 grams. It is also small enough that it can be held in one hand, measuring at 21.5 cm by 12.5 cm. This means it won't take up a lot of space in his schoolbag. And the textured back provides added grip. The long lasting 4,620mAh battery is a nice feature as well, since he can charge it at home before school and can leave the charging cable at home. The idea of sending my son to school with an expensive piece of technology doesn't sit well with me. Luckily, ZTE's Grand X View 2 tablet won't break the bank. In fact, you can purchase one for under $200 or for as low as $0 on a data plan available through Bell, Fido, Rogers and Virgin. Disclosure: This post has been sponsored by ZTE Canada. Any opinions expressed therein are my own. We were looking for something sturdy and of good quality for the back and forth of going to school. Thanks for this info. The price point is pretty ideal! Wow, 8GB of internal storage with expandable memory up to 128GB that is very good for this price. Sounds like a well price tablet with all the features that we would love in a tablet. I don't think that this tablet would be good just for kids, I believe that it would be good for a lot of adults too. Looks like a great tablet! It looks quite small, I think kids would love it! Between the price and all the features it does sound impressive! Sounds like a great tablet, the price is awesome! Perfect tool for school and home! Something as simple as the textured back! Love it. I personally love that feature. And it does the job! I really like the reasonable price of this product,thanks for the info ! I'm always up for a bargain! Sounds super useful - perfect for school, work or home!